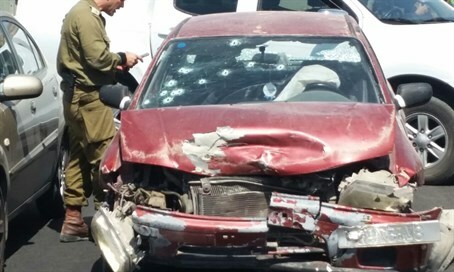 Terrorist eliminated after plowing car into Israelis at entrance to Jewish town. A Jewish Israeli couple in their 50s were lightly injured in a car ramming attack at the entrance to the town of Kiryat Arba, next to Hevron. The victims were treated at the scene by paramedics before being transferred to hospital for further treatment. The terrorist - a Palestinian woman - was shot dead at the scene by alert soldiers. The Hevron/Kiryat Arba region in Judea south of Jerusalem had been a hotbed of stabbing and car ramming attacks over the past several months, but terrorist incidents had significantly decreased in the past few weeks. The recent "wave of terror" has calmed down considerably overall throughout Israel, but Arab terrorists have still conducted periodic attacks, including the recent murder of four people at Tel Aviv's Sarona Market. More recently, three people were injured last week in a rock-throwing attack which targeted a bus traveling through Jerusalem.